McBryde had been here two weeks, and Tony (a friend of McBryde and Aaron from school) had just arrived, when we set off for a weekend in the most beautiful place I’ve ever visited. Believe it or not, we went to Rivendell. So all that to say, I was pretty excited to see this place. We left as soon as Aaron got off work, and started the long drive down to Switzerland. We stopped half-way for a nice pizza at a gas-station restaurant (lots of those here in Germany!) and then continued our journey, not arriving until about 1am. It was somewhat frustrating to be driving through the alpine valleys in the middle of the night, knowing that the landscape was beautiful, but invisible to us in the dark. However, when we got out of our car at the hostel, I looked up at the sky and was awestruck by the clarity of the stars. Never before had I seen such a night sky! Miles away from any large cities, and high in the clear mountain air, I could see more stars than I had ever seen before. The sound of invisible waterfalls echoed all around us, and we left the windows open as we fell asleep, lulled by the sound of the thundering water. The view that opened out before us when we awoke was breathtaking. Miles of valleys surrounded by huge, snow-capped mountains, and dotted with Swiss chalets, cows wearing bells, and wildflowers of every color. Dozens of waterfalls sparkled in the sun. It was paradise. We spent our days walking around the quaint little towns, hiking the high mountain trails, and joining our friends from our Bible Study group for dinner and games after the sun set. 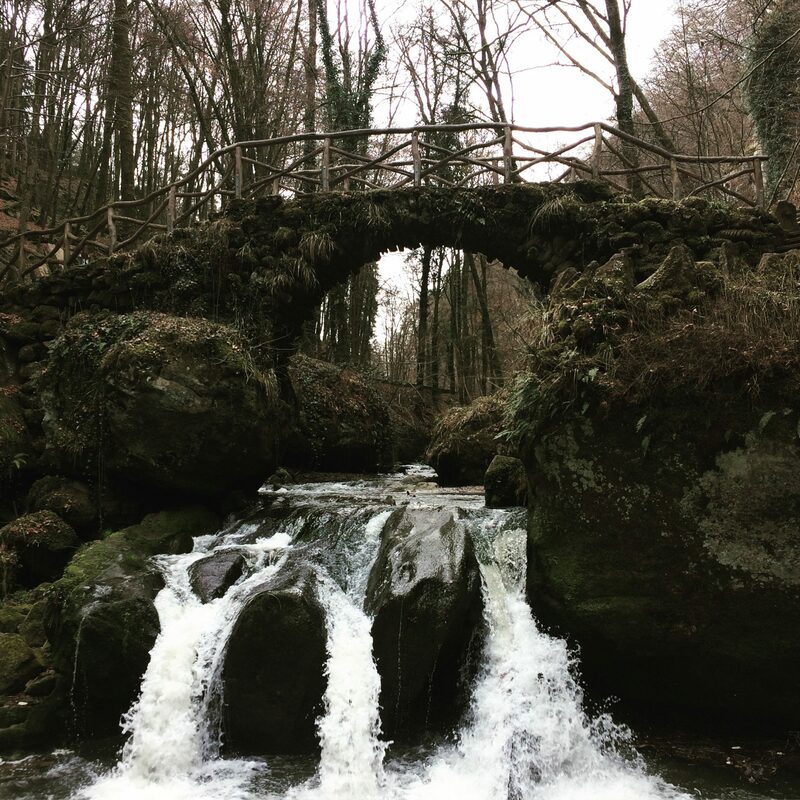 On our second day, we set off in search of the famous Reichenbach falls – the very same where Sherlock Holmes and Professor Moriarty had their epic show-down. Besides being of literary interest, the falls themselves, and the walk up to them, were breathtaking. We had explored all around the falls and river and were heading back, when Aaron spotted a crevice in the rock and some loose stones. We had explored all around the falls and river and were heading back, when Aaron spotted a crevice in the rock and some loose stones. Moving these aside, he found a small tin box with a note inside. Apparently the note was left by a band named Moriarty with instructions on how to access a limited-edition song: only one of thirteen caches in the world that would give you access to it! Another group of adventurers had found the cache, and left a note and an old postcard inside. We added a Swiss patch, and left our names and the date, and carefully returned the cache to the crevice. Maybe some other folks will come after us and add to it! Another day we rode the funiculars up the Schilthorn mountain, and hiked all the way back down. We passed through a village just when we were getting hungry for lunch, and found a large tent where the village was holding a festival! We ate brotchen and bratwurst under the large tent, resting our legs and listening to a band of yodelers… yodel! We hiked down the mountain – quite a long and difficult hike, and arrived in the valley just as the sun set. I gasped – the view spreading out in front of us was the very one that Tolkien immortalized in his drawings of Rivendell. It was with great regret that I left this beautiful valley. We drove to a point on the beautiful lake – its clear waters reminded me of the Mediterranean – and had our last picnic on the sandy shores. It was a wonderful weekend, spent with friends and family in one of the most stunning places on earth. As such, it will always remain in my memory as just a little slice of paradise… or Rivendell. Beautiful! Thanks for sharing this and allowing us to live it for a few moments! Thank you for reading it, and joining in on my adventures!